As an online organization, you understand the necessity of embracing digital transformation to promote engagements and readily respond to your customers’ evolving needs and expectations. Central to this pivotal shift is the ability to improve your digital intelligence and gain the actionable insight required to execute transformative initiatives that are based on a true understanding of your customers’ behaviors, journeys and experiences – empowering you to deliver value across your business that is aligned with customer expectations and demands. By applying powerful analytic capabilities to customer data, Watson™ Customer Experience Analytics (Watson CXA) and IBM® Tealeaf® Customer Experience on Cloud (Tealeaf CX on Cloud) offers actionable insight into customer behavior and assists you with making better decisions to drive digital transformation across your business. Utilizing struggle analytics, you can easily monitor specific processes, pages and events on your site to quickly identify where your customers struggle, while real-time alerting can be enabled to quickly notify you at the first sign of struggle. By then applying session replay technology, you can identify why your customers struggle – offering a valuable macro to micro view on customer behavior that you can use to rectify issues and optimize the many campaigns, processes and digital experiences that drive business across your site. Journey analytics can assist further, by allowing you to readily compare customer paths across unique segments like web, mobile and email, offering you a deeper understanding of multi-channel customer journeys and the ability to identify paths where your customers may struggle and recognize what actions may lead your customers to convert. Additional capabilities like geospatial analytics can expand your reach and help you understand where your customer are engaging or struggling with your organization across regions, offering you additional insight you can use to make more targeted and informed decisions about your business and execute digital transformation efforts that focus on areas of growth and global opportunities. Successful digital transformation requires a customer-centric approach that enables you to leverage data-driven insights based on customer behaviors to create engaging and optimized customer experiences across your entire organization. 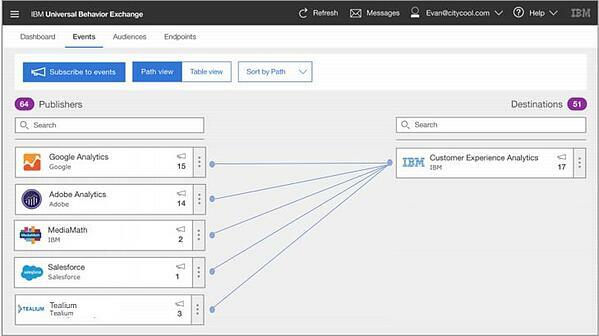 Creating advanced search events and customized reporting using Watson CXA and Tealeaf CX on Cloud can assist by providing deeper insight into customer behavior before, during and after performing search, offering the opportunity to optimize search terms and functions and improve content on your site to more actively engage your customers. Similarly, developing business process scorecards can help you measure and score your overall business process success by identifying the abandonment and conversion rates across and within each step of a critical business process, allowing you to recognize and root out inefficiencies in your important steps and optimize business processes across your organization. The capacity to segment your customer data and compare unique segments of customers offers you the capability to recognize issues with particular segments and optimize experiences, engagements and processes across your entire digital channels. Applying usability analytics like heat maps are also very beneficial in providing insight into customer interactions on your pages and help you recognize usability issues with your site. As heat map overlays identify regions of a page where customers click or hover, they can assist you with identifying high and low interest areas on a page and providing insight you can use to replicate engaging content, make your pages more personal for your customers and optimize your page design to enrich the customer experience. The new feature of anomaly detection can further boost your business intelligence by providing real-time, actionable insights that assist you with detecting unusual patterns, or outliers, in your customer behavior data and determining contributing factors – helping you discover unexpected incidents and quickly respond to evolving issues to optimize and transform your entire online business performance. Get started with building digital intelligence to transform your business! Implementing effective customer behavior analysis can set the stage for the discovery of actionable insights you can use to drive digital transformation across your business. To help you get started with delivering consistent and extraordinary customer experiences, Pereion Solutions has developed a series of videos that introduce the important use cases you can execute to improve your digital intelligence and put customer insights to work using Watson CXA and Tealeaf CX on Cloud. Also available is our ebook, “Watson, Can You Help Improve Digital Customer Experience?,” that complements the use case videos and includes formulas for success that provide a step by step process for getting started with effective digital analysis that can help you visualize the customer journeys and create the actionable insights you need to optimize customer experiences and digitally transform your business. Many new features and improvements were introduced in Q3 for Watson Experience Analytics (CXA), IBM Tealeaf Customer Experience (CX) on Cloud and IBM Digital Analytics (DA). Enhancements to navigation allow users to pin favorite pages and easily move between all Watson Customer Engagement tools. User management updates make it easy to add Digital Analytics users and assign a role as well as grant Admin privileges to a specific user. The Digital Analytics client ID that provides flexible report data is now visible. You can now replace top path reports with a customized report on the Overview dashboard and in the left navigation. Contact IBM Support for assistance. Anomaly Detection is new feature that has been added that detects anomalies in data. Users now can indicate report metrics to be monitored. The Simple Event Capture UI has been enhanced with the addition of a Match any content toggle. For Tealeaf on Cloud customers who provision the organization on their own, time zone input is now required. This addresses time zone information conflicts that periodically occur. Newly added to the Asset Manager is an option to view Native Templates. Use this feature to view existing templates and to incorporate custom templates for use with native replay. Bot Detected, an out-of-the-box session attribute, has been added to the Event Manager. Now you can easily identify session searches that are from bots with Bot Detected. A new section, Admin Workspaces, provides a new workspace for administrators and a central location for tracking Anomaly detection metrics. This section is visible to only Sysadmin, OrgAdmin and SupportUser roles. 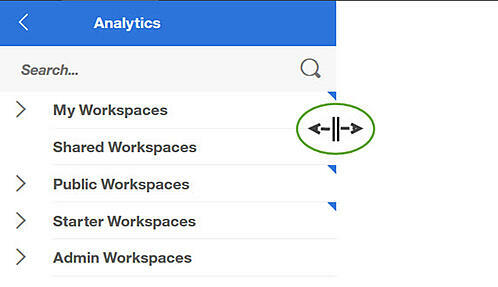 The ability to select and add multiple widgets at once to your workspace. Create new hit attribute and Create new step attribute buttons have been incorporated into the process of creating Events. Now you no longer need to abandon the Event you are creating when you want to add a Hit or Step attribute. Select Multiple has been added to the Event Manager allowing you to simultaneously add multiple conditions to an Event. The MMI Report has been enhanced to include MMI data from export sessions. Replay has been set as the default view for Consolidated session replay. Improvements to the Replay user interface permit users to resize the left navigation panel. Session list has been enhanced to allow users to adjust column width for an improved view of the Session list table. An alphabetized applications list can now be found in the Applications table. This makes it easier for users to quickly find an application. A numeric indicator has been added to the blue flag in the navigation pane of Session replay. Making it helpful to identify the exact number of steps for a screen that matches the search criteria. Snapshot Gallery sort order is in a persisted state when accessing over multiple sessions. Looking to improve digital intelligence and create actionable customer insights? Click the tile below to view Pereion Solutions' IBM Watson Customer Experience Analytics and Tealeaf on Cloud Customer Use Case videos. The ability to login to IBM Digital Analytics with an IBMid. Now when a user logs in to DA for the first time, using an IBMid, the user is prompted to link the IBMid with a DA client ID. Support for recurring email delivery of workspaces. In prior releases, you could email a workspace only one time. Now with this added feature, workspace emails can be scheduled daily, weekly or monthly using the Schedule Email drop down. Newly released, is an alert feature that displays a 5-minute countdown. You can now indicate if you wish to stay logged in or just simply log out. In earlier releases, DA did not allow you to email workspaces that contained personal data. Now, reports with personal data are excluded from workspaces that you email. A notification feature is displayed at the top of the DA screen when ad hoc reports are finished processing. In addition, a Report status menu has been added to the DA header. Allowing you to track the status of active ad hoc reports as they are running (Running reports) or if they have finish processing (Completed reports). The Standard report tooltip shows more detailed information like report type, report frequency and if the report contains personal data. Additionally, you can now share views of Standard reports with others and set start dates for segments in Standard reports to 800 days in the past. Now only users with PII access are able to select dimensions that contain personal data. All users without PII access are restricted. Marketing Channel and Marketing Program reports are replaced by the beta reports. Now you can create custom channels in DA and those channels will be included in your Standard reports. Using Watson CXA, Pereion Solutions can help you identify your customers' paths, understand your customers' struggles and experiences, and then optimize your site and maximize business opportunities. In our eBook, “Watson, Can You Help Improve Digital Customer Experience?,” we complied a list of the top 10 use cases you can implement to improve your digital intelligence and put customer insights to work with IBM Watson CXA. Also included, are links to specific formulas that provide a step by step process for getting started with effective digital analysis and optimized customer experiences. Click below to download our eBook. 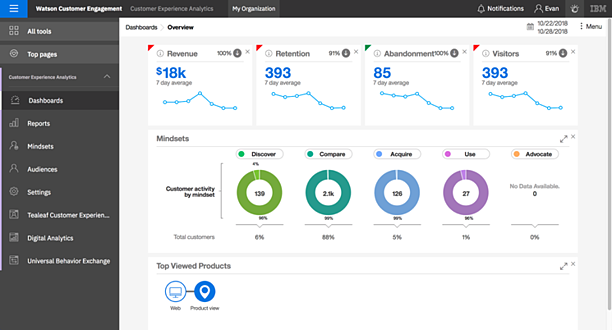 Several improvements and new features were released in Q2 for Watson Customer Experience Analytics (CXA), IBM Tealeaf Customer Experience (CX) on Cloud and IBM Digital Analytics (DA). In addition, Watson CXA was named a leader in customer experience solutions. Let's take a more detailed look at the latest enhancements. User management preview allows you to see a list of your users and roles without having to leave Watson CXA. **Flexible reports are currently available only as a limited release. Contact your customer representative for more information. In the Forrester Wave™: Customer Analytics Solutions Q2, 2018 report, Watson CXA recently ranked as a top performer in customer experience analytic solutions. Learn more about why IBM Watson CXA is a leader in the pack, how it helps to bring about better business results and what is driving the need for "do-it-for-me”(DIFM) marketing customer insight solutions. Click here to download the Forrester report from IBM. Ability to delete all sessions option has been added to the Session Search list. This feature allows users to delete sessions from IBM Tealeaf on Cloud, including sessions exported to IBM Bluemix COS, and IBM Softlayer COS. Remove user's personal information from Tealeaf reports by using the Purge feature. You can selectively delete dimension values from displaying in any report to any level of the user (including org admins, support users, sysadmins). Additionally, you can purge all historical data associated with the dimension from Tealeaf on Cloud reports. When you specify Exists on Hit or Exists on Step, the distance is calculated only when the Event fires and fires on the current Hit or current Step, otherwise the fired events are ignored. This can be useful when you need to track all occurrences of a Distance Event. Expanded capabilities for the Asset Manager. The ability to search, view details, download, delete and upload Web Replay Assets capabilities have been included in the Asset Manager. Can't remember which sessions you viewed? Now viewed sessions are marked with play icons making it easier for you to see which sessions you previously viewed. Ability to authorize a regular user to help manage Session Export tasks with a new role named SessionDataAdmin. Users that are assigned the SessionDataAdmin role will have access to the Data Export feature and can create exit and manage Session Export tasks. An All Alerts option has been added to the Alert Manager. In the past, alerts were viewable only by the person who created them and by the users with whom the Alert was shared. Now, the All Alerts option provides the OrgAdmin access to every alert for the organization, making it easy to access, manage and troubleshoot Alerts. New and improved reports features. Click stream report can now expand to 10 nodes. Top Line Metrics reports now support quarter-to-date and year-to-date date ranges. Management of personal data has been expanded in legacy Digital Analytics and associated applications. Click here for more details. Get your answers from Watson! Simply click the Watson icon at the top right of your screen for answers to all your questions. For support, click the Support card or for technical information, click the Develop card both located at the bottom of Watson Assistant. In our eBook, “Watson, Can You Help Improve Digital Customer Experience?,” we put together a list of the top 10 use cases you can implement to improve your digital intelligence and put customer insights to work with IBM Watson CXA. Click below to download our eBook. Pereion Solutions can assist you in identifying your customers' paths, understanding your customers' struggles, and experiences and then optimize your site and maximize business opportunities using Watson CXA. Read how one client delivers outstanding customer experiences using Watson CXA coupled with the help of Pereion Solutions. Click below for a copy of the case study. Customer Experience Analytic solutions like Tealeaf CX on Cloud and Watson CXA can be powerful tools that provide visibility into your customers’ online experiences and the opportunity to identify areas where your customers may struggle. The challenge can be fully utilizing the tools and ensuring you are getting a return on investment (ROI) from your Customer Experience Analytic solution. Gaining the necessary digital intelligence to effectively optimize business outcomes and create delighted customers can take time, experience and a level of expertise. We can help you with building events and reports, so you can focus on the analysis and your business. Learn how Pereion Solutions, an IBM Gold Business Partner with Expert level competency in Watson Marketing, can provide expertise in your efforts to optimize customer experiences and maximize your ROI. Transforming your customer data into meaningful and actionable insight requires a comprehensive customer experience methodology. Pereion Solutions can help you get started with creating more relevant data and actionable customer insight to drive extraordinary experiences. With vast experience in customer analytics, Pereion Solutions’ approach assists you to identify the path your customers take, understand your customers’ struggles and visualize the customer experience, and optimize your site and maximize opportunities, generating the digital intelligence and actionable insight you can use to make better business decisions. To understand more about how Pereion Solutions can help you efficiently leverage Tealeaf Customer Experience on Cloud and Watson CXA and enable you to effectively focus on actionable customer insight to move your business forward, click here to review the recent IBM guest blog by Pereion Solutions. Leveraging deep expertise in customer experience analytics, Pereion Solutions has developed CXA formulas for success that provide a step by step process for getting started with effective digital analysis and optimized customer experiences using Tealeaf CX on Cloud and Watson CXA. Designed to help you capitalize on analytic capabilities, the CXA formulas assist you with gaining the insights you need into customer journeys, marketing campaigns and channels, mobile experiences, customer struggles, search and engagement optimization, conversion rate optimization, and more. To subscribe to the Pereion Solutions’ CXA Formula blog and stay up-to-date on best practices in customer analytics, click here. Shubert Ticketing, a leading international provider of ticketing services, was faced with the need to optimize their customers’ experiences across a complex, high volume check-out flow for both their online and mobile processes. With support from Pereion Solutions, Shubert Ticketing effectively leveraged Watson CXA to gain the necessary actionable insight into their customers’ behaviors and is successfully optimizing their customers’ digital experiences by reducing struggle. To learn more about how Pereion Solutions’ expert experience with customer behavior analytics was instrumental in the rapid deployment of Watson CXA and allowed Shubert Ticketing to quickly realize financial value by delivering higher-quality experiences, read the IBM case study for Shubert Ticketing by clicking on the button below. Let us help you maximize your ROI! With demonstrated expertise in Tealeaf CX on Cloud and Watson CXA, let Pereion Solutions help you get started now with recognizing increased value from gaining actionable insight and optimizing your customers’ experiences. Take advantage of a limited-time promotional service offering extending 20% off the pricing of a service pack from Pereion Solutions. Designed to address a wide range of service needs, Pereion Solutions’ service packs provide you flexible consulting options that will enable you to focus your time and efforts on business insight to boost your bottom line. To learn more about this offer and the service packs available from Pereion Solutions, click the button below.